Black Dog & Leventhal, 9781579129491, 240pp. 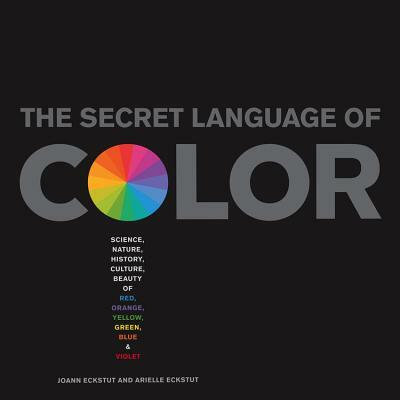 Organized into chapters that begin with a fascinating explanation of the physics and chemistry of color, The Secret Language of Color travels from outer space to Earth, from plants to animals to humans. In these chapters we learn about how and why we see color, the nature of rainbows, animals with color vision far superior and far inferior to our own, how our language influences the colors we see, and much more. Between these chapters, authors Joann Eckstut and Ariele Eckstut turn their attention to the individual hues of the visible spectrum?red, orange, yellow, green, blue, and violet?presenting each in fascinating, in-depth detail. Including hundreds of stunning photographs and dozens of informative, often entertaining graphics, every page is a breathtaking demonstration of color and its role in the world around us. Whether you see red, are a shrinking violet, or talk a blue streak, this is the perfect book for anyone interested in the history, science, culture, and beatuty of color in the natural and man-made world. Joann Eckstut is a leading color consultant who works with a wide range of professionals including architects, developers, and manufacturers of name brands. She is founder of The Roomworks, a prominent NYC interior design firm and is one of 12 designers chosen by the Color Association of the United States to create the yearly interior/environmental forecast that is bought by major industries to keep up with color trends. She is the author of Room Redux: The Home Decorating Workbook and The Color Palette Primer: A Guide to Choosing Ideal Color Combinations for Your Home. She lives in Rensselaerville, New York. Arielle Eckstut is the author of 8 books including The Essential Guide to Getting Your Book Published. She is co-founder of The Book Doctors with her husband David Henry Sterry, a company dedicated to helping writers successfully publish their books. She is also co-founder of the iconic company, LittleMissMatched, which has become a national brand with stores all over the United States including Disneyland, Disney World, and Fifth Avenue in New York City. She lives in Montclair, New Jersey.